This institution was founded at Berlin by Dr. Israel Hildesheimer for the training of Orthodox rabbis. 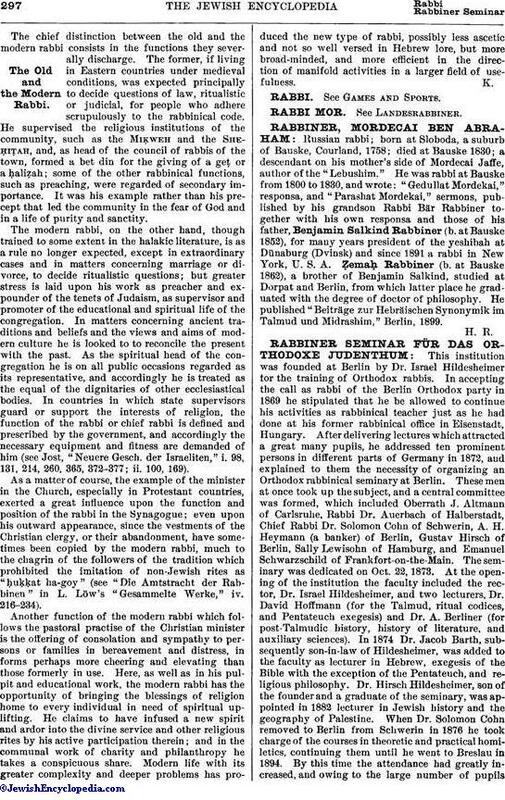 In accepting the call as rabbi of the Berlin Orthodox party in 1869 he stipulated that he be allowed to continue his activities as rabbinical teacher just as he had done at his former rabbinical office in Eisenstadt, Hungary. After delivering lectures which attracted a great many pupils, he addressed ten prominent persons in different parts of Germany in 1872, and explained to them the necessity of organizing an Orthodox rabbinical seminary at Berlin. These men at once took up the subject, and a central committee was formed, which included Oberrath J. Altmann of Carlsruhe, Rabbi Dr. Auerbach of Halberstadt, Chief Rabbi Dr. Solomon Cohn of Schwerin, A. H. Heymann (a banker) of Berlin, Gustav Hirsch of Berlin, Sally Lewisohn of Hamburg, and Emanuel Schwarzschild of Frankfort-on-the-Main. The seminary was dedicated on Oct. 22, 1873. At the opening of the institution the faculty included the rector, Dr. Israel Hildesheimer, and two lecturers, Dr. David Hoffmann (for the Talmud, ritual codices, and Pentateuch exegesis) and Dr. A. Berliner (for post-Talmudic history, history of literature, and auxiliary sciences). In 1874 Dr. Jacob Barth, subsequently son-in-law of Hildesheimer, was added to the faculty as lecturer in Hebrew, exegesis of the Bible with the exception of the Pentateuch, and religious philosophy. 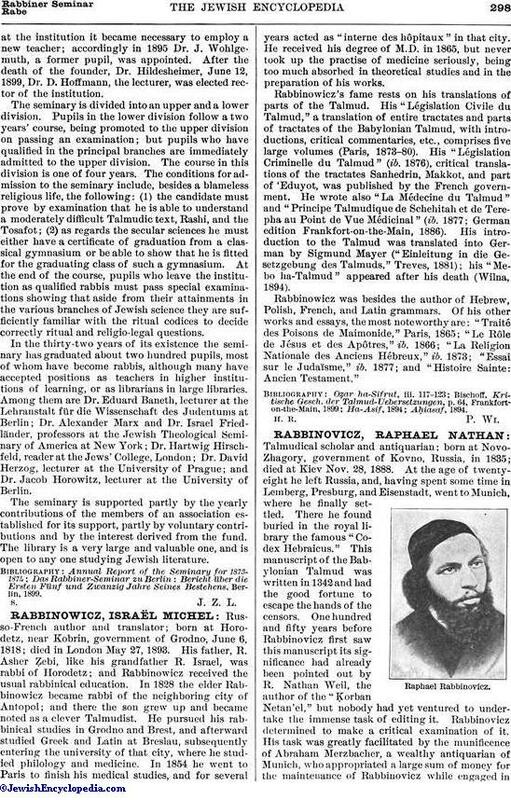 Dr. Hirsch Hildesheimer, son of the founder and a graduate of the seminary, was appointed in 1882 lecturer in Jewish history and the geography of Palestine. When Dr. Solomon Cohn removed to Berlin from Schwerin in 1876 he took charge of the courses in theoretic and practical homiletics, continuing them until he went to Breslau in 1894. By this time the attendance had greatly increased, and owing to the large number of pupilsat the institution it became necessary to employ a new teacher; accordingly in 1895 Dr. J. Wohlgemuth, a former pupil, was appointed. After the death of the founder, Dr. Hildesheimer, June 12, 1899, Dr. D. Hoffmann, the lecturer, was elected rector of the institution. The seminary is divided into an upper and a lower division. Pupils in the lower division follow a two years' course, being promoted to the upper division on passing an examination; but pupils who have qualified in the principal branches are immediately admitted to the upper division. The course in this division is one of four years. The conditions for admission to the seminary include, besides a blameless religious life, the following: (1) the candidate must prove by examination that he is able to understand a moderately difficult Talmudic text, Rashi, and the Tosafot; (2) as regards the secular sciences he must either have a certificate of graduation from a classical gymnasium or be able to show that he is fitted for the graduating class of such a gymnasium. At the end of the course, pupils who leave the institution as qualified rabbis must pass special examinations showing that aside from their attainments in the various branches of Jewish science they are sufficiently familiar with the ritual codices to decide correctly ritual and religio-legal questions. In the thirty-two years of its existence the seminary has graduated about two hundred pupils, most of whom have become rabbis, although many have accepted positions as teachers in higher institutions of learning, or as librarians in large libraries. Among them are Dr. Eduard Baneth, lecturer at the Lehranstalt für die Wissenschaft des Judentums at Berlin; Dr. Alexander Marx and Dr. Israel Friedländer, professors at the Jewish Theological Seminary of America at New York; Dr. Hartwig Hirschfeld, reader at the Jews' College, London; Dr. David Herzog, lecturer at the University of Prague; and Dr. Jacob Horowitz, lecturer at the University of Berlin. The seminary is supported partly by the yearly contributions of the members of an association established for its support, partly by voluntary contributions and by the interest derived from the fund. The library is a very large and valuable one, and is open to any one studying Jewish literature. Das Rabbiner-Seminar zu Berlin: Bericht über die Ersten Fünf und Zwanzig Jahre Seines Bestehens, Berlin, 1899.